Optical amplifier, with the introduction in 1990s, conquered the regenerator technology and opened doors to the WDM technology. It is mainly used to amplify an optical signal directly, without the need to first convert it to an electrical signal. There are many types of optical amplifiers, namely Raman amplifiers, erbium doped-fiber amplifiers (EDFAs), and semiconductor optical amplifier (SOA). This article will make a clearer introduction to SOA amplifier, and analyze its advantages and disadvantages. SOA optical amplifiers use the semiconductor as the gain medium, which are designed to be used in general applications to increase optical launch power to compensate for loss of other optical devices. Semiconductor optical amplifiers are often adopted in telecommunication systems in the form of fiber-pigtailed components, operating at signal wavelengths between 0.85 µm and 1.6 µm and generating gains of up to 30 dB. Semiconductor optical amplifier, available in 1310nm, 1400nm, 1500nm, 1600nm wavelength, can be used with singlemode or polarization maintaining fiber input/output. The basic working principle of a SOA is the same as a semiconductor laser but without feedback. SOAs amplify incident light through simulated emission. When the light traveling through the active region, it causes these electrons to lose energy in the form of photons and get back to the ground state. Those stimulated photons have the same wavelength as the optical signal, thus amplifying the optical signal. As the solution below, 120km Metro Networks by Using an SOA amplifier. You may wonder why not use EDFA in the above networks. Theoretically, SOA optical amplifiers are not comparable with EDFA in the terms of performance. 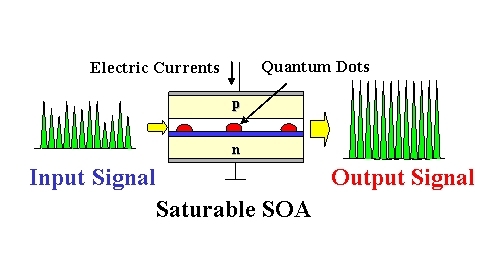 The noise figure of SOA optical amplifier is typically higher, the gain bandwidth can be similar, SOAs exhibit much stronger nonlinear distortions in the form of self-phase modulation and four-wave mixing. Yet, the semiconductor optical amplifier is of small size and electrical pumped, which is often less expensive than EDFA. Additionally, SOA can be run with a low power laser. How to Choose SOA Optical Amplifier? When selecting SOA amplifier, you have to check the every detailed parameter in the product data sheet. But, seriously, do you understand it? No, please read the following part. The key parameters used to characterize a SOA amplifier are gain, gain bandwidth, saturation output power and noise. Gain is the factor by which the input signal is amplified and is measured as the ratio of output power to input power (in dB). A higher gain results in higher output optical signal. Gain bandwidth defines the range of bandwidth where the amplification functions. A wide gain bandwidth is desirable to amplify a wide range of signal wavelengths. Saturation output power is the maximum output power attainable after amplification beyond which no amplification is reached. It is important that the SOA has a high power saturation level to remain in the linear working region and to have higher dynamic range. Noise defines the undesired signal within the signal bandwidth which arises due to physical processing in the amplifier. A parameter called noise figure is used to measure the impact of noise which is typically around 5dB. SOA amplifier is the economic, high-performance solution for long-hual WDM networks. 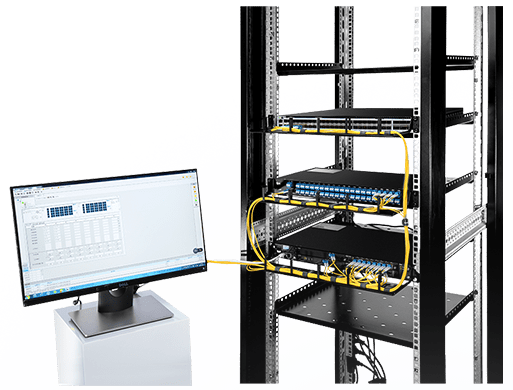 SOA amplifier, due to its features, can be used in Booster and in-line amplification, optical network, general purpose test and measurement and fiber sensing. However, it also has its limit. In semiconductor optical amplifiers, electron-hole recombination occurs which will affect the performance of the whole line. FS offers EDFA, SOA, Raman optical amplifiers of excellent quality and price. For more detailed information, please feel free to contact us.